The jury has cast their votes. 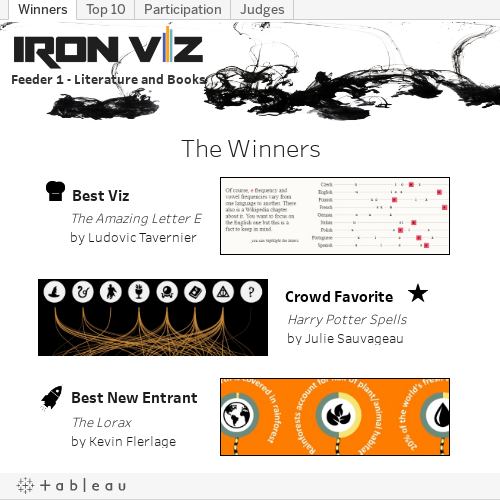 We have a winner for the first feeder of this year’s Iron Viz Global competition - The first of the three data viz wizards who will join us at Tableau Conference 2018 to compete for the Iron Viz title. It wasn’t easy to pick from more than 60 high-quality vizzes that the Tableau community submitted, each one of them telling a different fascinating data story within the theme of “Books and Literature”. Who knew that there are so many data-literate bibliophiles out there. But there can only be one viz to rule them all. Cole Nussbaumer Knaflic. Cole is the bestselling author of Storytelling with Data: a Data Visualization Guide for Business Professionals, writes the popular blog storytellingwithdata.com, and is the voice behind the storytelling with data podcast. Cole’s unique talent was honed over the past decade through analytical roles in banking, private equity, and on Google’s People Analytics team. Alberto Cairo. Alberto is the Knight Chair in Visual Journalism at the University of Miami. He's the author of the books The Functional Art (2013) and The Truthful Art (2016) and has been director of infographics and visualization at news publications in Spain (El Mundo) and Brazil (Editora Globo.) He's also currently a consultant for Google News Lab. Alberto is currently working on his third book, which will be published in 2019. Andy Cotgreave. Andy is co-author of The Big Book of Dashboards, columnist for InfoWorld and Technical Evangelist at Tableau. He has over 10 years’ experience in data visualization and business intelligence, first honing his skills as an analyst at the University of Oxford. He has judged the Information is Beautiful Awards since 2016 and recently won Analytics Professional of the Year in the 2018 Big Data Excellence Awards. Ellie Fields. Ellie leads several engineering teams at Tableau, including the Tableau Public team. She joined Tableau in the early stages of the company in 2008 and has helped launch Tableau Public and Tableau Online, and grow the entire product suite as well as Tableau’s robust customer community. Before Tableau she worked in product management at Microsoft and in late-stage venture capital. A huge thank you to everyone who helped with the judging! That is not to say that the jury had it easy. The standard was incredibly high, and, as can be seen in the chart above, the top 10 vizzes all received fantastic scores from our panel of judges. What we also love is the number of contestants who entered for the first time - with awesome vizzes. One of them even made it into the top 3, which is why we are delighted to give Kevin Flerlage the award for the Best New Entrant. Congratulations Kevin! Congratulations also to Julie Sauvageau. Her viz about Harry Potter spells - and no literature-themed viz competition can go without a Harry Potter viz - drew the hearts of the Tableau community and is a very deserved Crowd Favorite! Well done to all that entered! If you want to give it another shot, or haven’t had the chance to participate in Iron Viz before: the next feeder will be announced in three weeks. See you soon.